Will week 4's selection do anything to change my (negative view) of this year's Melodifestivalen entries? Let's have a listen and check them out. "Don't Say No" - Midnight Boy. I'm not familiar with this guy's work, and he seems to be more famous for a certain YouTube video than anything else. Well, on first listen I like this! Clearly very influenced by Dead or Alive's "You Spin Me Round" - one of my favourite pop songs of the 80s - and MB himself comes over like a Poundland Pete Burns. This won't do anything and will probably prop up the bottom of tonight's scoreboard, but I've finally found a song I might want to listen to again. "Black Swan" - Caroline Wennergren. She's back after a few years' absence, but straight into the 'slot of doom' and I can't see this getting anywhere. It's a dramatic, retro-styled song with little James Bond theme influences, although this kind of thing's been tried already in recent years in Melodifestivalen ("Killing Me Tenderly"/"Never Been Here Before" and probably a few others) so it's all sounding a bit dated by now. "Building It Up" - JTR. They've taken a bit of One Direction, a bit of The Wanted and some 5 Seconds of Summer and put it into the boy-pop blender and out came "Building It Up". It's generic boyband fodder and its success will depend on just how much they will appeal to their demographic/target audience on the night. "Guld och gröna skogar" - Hasse Andersson. Not my thing at all, but this kind of folk/country music has its fans, he's a well known personality and that might be enough to get him to AC. Hopefully not though, as I wouldn't want to see it stealing a qualification place from a better song. "Make Me (La La La)" - Dinah Nah. She has pink hair and the coolest name, and this might just have enough contemporary pop/dance appeal to qualify to something or other, but unfortunately it's a little on the generic side for me and the repeated la-la-las remind me of "La La Love". Which, if I remember, was particularly popular in Sweden so this might bode well for Dinah? "Ett Andetag" - Annika Herlitz. A.K.A. the voice of the Swedish version of "Let It Go" from Frozen. This is a big old fashioned schlager ballad complete with - yes of course - a wind machine, and it will probably have certain sections of the schlager community in raptures. It doesn't appeal to me though. "Heroes" - Måns Zelmerlow. Out of the light like a star like a hero! Here comes Måns to save Melodifestivalen! Based on the short clip it's a contemporary dance-pop song (the Swedish press have compared it to David Guetta's "Lovers On The Sun"), there's some big gimmicky staging, and while it may not be much of a song compared to "Cara Mia" or "Hope And Glory", I like what I've heard so far and I'm going to like the full song too. Heat 3 already! I didn't have the chance to do a preview last week but it was a very pleasant surprise to see Magnus Carlsson make his comeback and be rewarded with a place in the final, along with former Idol participant Mariette whose song was being tipped last week as a possible Melfest winner. But that was last week and we're now on to another crop of songs so let's have a listen. Kalle was the winner of the Svensktoppen Nästa competition (automatically entitling the winner to the 'slot of death' in a Melfest heat) and I really liked the song which he won that competition with. This isn't as good although it's a G:son song with some schlagery appeal and reminds me of something Barbados might have done. "Bring Out The Fire" - Andreas Weise. I have never liked this guy. He appears very arrogant and fame-hungry - maybe I'm wrong and doing him a disservice, I don't know, but that's the way he appears to me. The song's a mediocre take on "Let Me Entertain You" and I'm sorry but it's not even bringing out a spark, never mind a fire. "Living To Die" - Andreas Johnson. There is something quite reassuring about Andreas being back at Melodifestivalen, as it reminds us of all the years when he took part, those years when Melodifestivalen was good. I guess the title's a little off-putting. That aside, it's maybe a bit too low-key and doesn't really have the anthemic quality of some of his other Melfest entries, but might just sneak an Andra Chansen place. In this part of the world we would probably chuckle at the name 'Isa' as it reminds us of a character in the extremely popular comedy series "Still Game". This Isa is very different from that one of course! This is chart-friendly uptempo pop which I'm confidently predicting to qualify, probably to Andra Chansen. "I See You" - Kristin Amparo. It's a big shouty ballad which she co-wrote with Melfest sourge Fredrik Kempe. I can't really judge it on the clip, and would probably have to hear more of it to make up my mind although at this stage I'll say that she is better than the song. The good news is that this will be the last week we'll see Mr Smug as he is not, I repeat NOT - in the list of next week's songwriters. Hooray! Anyway this is looking like a definite qualifier. This was the guy who won Sweden's Got Talent, and Sweden loves him. We haven't had jojking at Eurovision since Norway 1980, and I doubt this would go all the way to Vienna for Sweden but is a guaranteed finalist. Again I can't really tell from the short clip how good this is, but *lazy comparison klaxon* I'm feeling a bit of Enigma with this one. He's just lovely, but my main gripe is that the staging of the song is absolutely ridiculous. Someone really needs to have a word with SVT about this trend of swamping a song with distractions, it's so offputting. At least that used to be the title of my old preview blog post but they're not even giving us a minute any more - just a measly 30 second rehearsal snippet which is presumably to build up the excitement and anticipation for what is many Eurovision fans' favourite national contest. We'll have to wait till this afternoon before we hear the songs in full. For the past few years I have watched every Melodifestivalen heat live (although am usually inclined to give Andra Chansen a miss). Normally I would be sitting with my laptop wired up to the TV just before 7.00pm UK time, getting increasingly anxious that the quality of the webstream will be ok, and bursting with excitement at the opening titles and the balloon-waving frenzy. But not tonight. 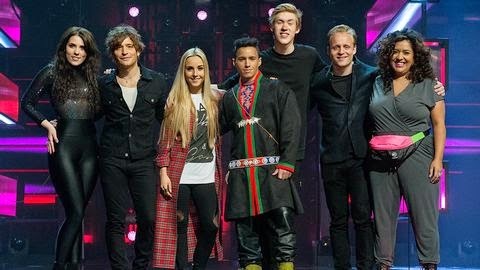 In recent years I have also grown to love the Danish national final. Regardless of the quality of the songs, DR always puts on a spectacular show. But last year, I chose to miss the DMGP final, to watch Melodifestivalen on the same evening and immediately regretted it, as I discovered that it was not being rebroadcast anywhere. Back then, I said that I wouldn't make that same mistake in 2015. So my laptop will be tuned to the DR webstream tonight and I will be watching Melfest on catch-up. But I digress, this post isn't about Denmark, I'm supposed to be reviewing song clips so let's get on with it. 1. "I'll Be Fine" - Molly Pettersson Hammar. When she was in Swedish Idol I thought she had an excellent voice with a maturity beyond her young years, and I thought it was inevitable that she would end up in Melfest one day. I'm surprised they're opening the show with this as I thought they would have gone for a bigger 'name' however on the evidence of the clip Molly certainly should be fine with this Ella Henderson-style tune. I get the feeling it could become a bit annoying, however need to listen to the verses before forming a real opinion of the song. 2. "Pappa" - Daniel Gildenlöw. No heavy rock this time from the Pain of Salvation frontman but instead an emotional number with heartfelt lyrics which could 'do a Linus Svenning' this time round although it just sounds a bit too wet and calculated. Again I'm only basing it on a very short clip, but 2nd position in the draw always indicates that SVT have given up on you before you've even started. 3. "One By One" - Elize Ryd and Rickard Söderberg. Now these two seem to be really going for it in the clip. A combination of big theatrical singing and rock. I think this will be a definite qualifier because they're going to perform the life out of it. I'm guessing that by the end of it we will all need a headache pill as Elize and Rickard spend 3 minutes trying to out-sing each other. 4. "Hello Hi" - Dolly Style. Yohio looks to have mutated into three girls who are bringing bubblegum back. Fans of Aqua-style pop are going to drool over this, and I'm guessing that much of the ESC fan community will do likewise. This doesn't really appeal to my own musical tastes but I'm probably eventually going to wake up screaming in the middle of the night with the refrain "I am Molly, I am Holly, I am Polly, hello hi!" stuck in my brain. Aargh. 6. "Can't Hurt Me Now" - Jessica Andersson. Although there's one less song in each Melfest heat this year, Did anyone hear "Knocking on Heaven's Door" here? Or is it just me? I like Jessica and am happy to see her back in the contest although can't see this having the same impact as "I Did It For Love". 7. "Sting" - Eric Saade. He sings "It's gonna drive you mad" and he's quite right because I am so disappointed by this song. I wasn't a fan of "Popular" but on the evidence of this clip that song was way better than this one. He always comes across as a bit too arrogant for my liking, I don't know about "Sting" but I've just had a read at the lyrics and they....'stink'! EDIT 9.45pm Saturday night: well you won't be too surprised to learn I got it wrong as usual! It's Eric and Jessica who are going direkt till Friends whilst Dolly Style and Behrang and Victor get the ticket to Andra Chansen. I'll catch up with this heat over the weekend as tonight was all about DMGP.